Sri Raghavendra is considered to be magnanimous and benevolent; countless devotees of his testify to the miracles he has performed. If you have any miracles performed by Guru Raghavendra in your life, please email it to me and the material would be duly reviewed and published . The sacred sand of the Moola Brindavana (Moola Mrithika) has very special significance, to cure diseases and throw away evil forces. Some of the miracles are listed below. During the life of Raghavendra Theertha , Chola Mandala(kindom) experienced political unrest. Internecine wars started and the king experienced hard times. The Kingdom experienced plunder and accession and a terrible famine followed. The king spent his money from his own coffers. But the famine did not abate. He approached Raghavendra Teeratha and prayed for his kind indulgence in the welfare of his subjects. The Swamiji readily consented and stayed at Tanjore for 12 years and came to the succur of the people and the king. The Swamiji with his miraculous powers was able to save the people. The king who was all grateful offered a jewelled nacklace to Swamiji and the same was put by Swamiji in the Fire of Sacrifice as the Swamiji was a great Viraghi person of great renunciation. The king felt insulted when he saw his presentation thrown into fire. The Swamiji knew his (King's) disturbances in mind and prayed to ParasuRama, the in-dweller of Fire God, and showed his amazing powers by getting it back. The king realized that Raghavendra Swamy was not an ordinary ascetic but the one who possessed divine powers. rAyaru had a devoted disciple who was studying the shAstras under his tutelage. The education was over and time had come for the disciple to return home and marry. As the head of the maTha, rAyaru was expected to bless this disciple and give him some money so that he could start life as a householder. In this case, it was even more imperative since the disciple came from a very poor family. However, he chose to bid farewell when rAyaru was on the way to the river for his bath and did not have anything to give him. When rAyaru expressed this, the disciple immediately replied “Even a handful of mud from you is even more precious than a gold full of gold”. RAyaru was pleased with his devotion and accordingly scooped up a handful of mud from the ground and gave it to the disciple. The disciple received this with total reverence and tied it into a bundle. He then placed the bundle on his head and started back home. He traveled till night and reached a village, and decided to halt there that the night. He approached the chieftain and requested him to grant him a place to sleep for the night. The chieftain said “You may sleep on the jugali of my house (a space just outside) but I have a problem. My wife is pregnant and is likely to deliver tonight. We have had extremely bad luck in the past because all our children have died immediately after birth. I am hoping that it is different this time”. The disciple agreed and slept immediately outside the main entrance to the house with his precious bundle as a pillow. At night, a dark and ferocious ghoul approached the house. This was the one that was killing all the children immediately after birth. This time, it had to cross the disciple to enter the house, but could not do so since the bundle under his head appeared like a wall of fire to it. It tried several times in vain and finally woke up the disciple. It told him “Your bundle contains a divine fire that is impossible for me to transgress. Why don’t you throw the bundle away? I will give you heaps of money, gold and precious jewels. The disciple pretended to agree, but quickly withdrew some consecrated mud from the bundle, and threw it on the ghoul. The effect of this action was spectacular. The ghoul screamed loudly and was immediately burnt to ashes. The noise woke up everybody in the house and they came outside the house. The disciple explained everything to them; at the same time the midwife came out of the house with the good news that the chieftain’s wife had delivered a healthy boy! The chieftain was ecstatic and hugged the disciple with joy. He attributed his good fortune to the advent of the disciple and thanked him profusely. The next day, he requested the disciple to stay back in the village and even offered his sister’s hand in marriage, along with a lot of wealth. The disciple gladly accepted this generous offer and lived happily. Thus, a handful of mud from rAyaru brought the disciple wealth, a good wife, powerful connections and life-long happiness! 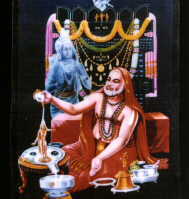 Sri Raghavendra Swamy desired a Brindavanam to be made for him, and Diwan Venkanna got one made. But the Swamiji ordered it to be reserved for a future pontiff that would come to the pontificate. He asked Diwan Venkanna to use the stone at Madhwaram fields for making a Brindavanam to him as the stone had been hallowed by a touch of Sri Ramachandra who had sat on it searching Sri Sitamata, This we see even to day as Moola Brindavanam at Mantralaya. Adjacent to the Moola Brindavan we see another Brindavan the Brindavanam of Sri Vadeentheertharu, a great grand son of Sri Rayaru, fifth descendant after Sri Rayaru in the Pontificate. He belongs to 18th Century. He was a great scholar and was as ardent devotee of his great grand father Sri Rayaru, His 'Gurugunasthavana' of 36 verses composed in Sanskrit is a master piece composition and he sand it near the Brindavan. The whole Moola Brindavan nodded in appreciation of the scholastic work.Sri Rayaru had been immensely pleased. Sri Rayaru has given a special place of recognition to Sri Vadeendraru, by keeping him by his side. Devotees worship Sri Vadeendraru also as they offer Pradakshina (going in circles) simultaneously. when they go to round the Moola Brindavana, Sri Vijayadasaru great devotee of Dasapantha opines that Sri Vadeendra Theertharu as the incarnation of Devaguru Sri Brihaspathi Acharya and Sri Vadeendrat heertharu functions are as the minister, almost a P.A. to the Swamiji in the Brindavana. Blessed is Sri Vadeendraru. He was just a boy of about 2 years when Sri Rayaru entered Brindavana. But Sri Rayaru knew his capabilities and earmarked a special position of favor to him in the years to come. Sri Vijaya Dasaru is another great devotee of Sri Hari, who appeared in our religious history much later. Born in poverty, bread in poverty, he was personified Poverty begging every meal. But he was sage "Bhrigumaharshi" incarnated now (Bhrigu Maharshi had established the supremacy of Lord Vishnu when he was commissioned by an assembly of rishis to report who was the greatest God of Gods.) One of the pontiffs in the lineage of descendants of Sri Rayaru, Sri Vasudhendra Theertharu was Vijaya dasas's contemporary. Dasa movement which had declined was revived by Vijaya by Vijaya dasa. He was inspired by Sri Raghavendra Swamiji to effect the revival and the Moola Brindavan at Mantralaya was his source of inspiration. He eulogized Sri Rayaru as a great Bhagavatottama and sung the glory of Sri Rayaru by a intuition which is being experienced now. Vijaya dasa disclosed the extraordinary Powers of Moola Brindavana and the greatness of Sri Rayaru ever present there in. Jagannatha Dasaru, is another celebrated Hari Dasaru who has spread the name and fame of Sri Rayaru, in 18th Century. Jagnnatha Dasaru went by the name Srinivasacharya, a profound scholar, but a vain Pandit. He offended Vijayadasa only to be blessed by him to get a further lease on his longevity. His life had come to an end and Vijaya dasa caused him a transfer of 40 years of life from the life of his disciple Gopal dasa. Sri Hari Kathamrutasara is a magnum opus, and encyclopedia of the doctrine of Sri Madhwa, all in vernacular-Kannada the common man's understandable language. It is said that he was no other than the younger brother of prince Prahaladha, who could talk to Sri Rayaru in his Brindavana. He has sung the glory of Sri Rayaru and His Grace to the multitudes. The English had come to trade in Bharath (India) , and they held a sway through their East India Company. 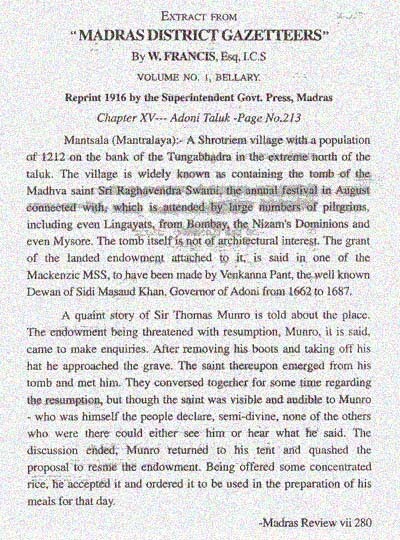 Sir Thomas Munroe was one of their officers, who was asked to resume Mantralaya an endowment village granted to maintain the Mutt and temple at Mantralaya. He came on his duty to resume. He was a noble soul. Sri Rayaru emerged from the Brindavan and convinced him about the irrevocability of the endowment and disappeared into the Brindavan giving him 'Mantrakshate' Sri Rayaru was visible to Mr. Munore only and not to others. This episode is recorded in the Madras Gazettier in the First quarter of 19th Century, copy of which can be pursued even to day in the records at the Collectorate at Anantapur. Such is the greatness of Sri Raghavendra Thirtha Swamiji and words fail to describe his greatness. A follower of another religion had the good fortune of being blessed by Sri Rayaru. An extract from the Gazette is listed below.